Breathing new life into a disused South Yorkshire train station was a group of willing volunteers recently. Eager residents offeredtheir services to create a new wildflower nature reserve in Penistone. Volunteers took part in their first conservation task day on an area of disused railway track beds and platforms at the town train station. A new partnership between the Trans Pennine Trail (TPT) Conservation Volunteers (Penistone-Dunford) and the Penistone Line Partnership saw 20 volunteers of all ages come together last month. They began by clearing litter and invasive scrub from the neglected piece of land between the active Penistone Station and the TPT. Working with the permission of the landowners, Network Rail, the volunteers were supported by Barnsley Council’s Penistone ‘Clean and Tidy’ initiative and the Countryside Ranger team who provided hand tools, litter removal help and the all-important drinks. Young, self-set trees and scrub were thinned out to allow the grass which has sprung up to flourish. Over time, the group hopes to fell most of the medium-sized trees with chainsaws and manage the grassland to encourage more wild flowers to set seed. Due to the limestone ballast left on the track beds it is hoped the reserve will come to mimic a limestone dale in terms of its biodiversity and flowers. A member of the volunteers, Trevor Mayne, said: “This was a really great start – everybody got really stuck in and we’ve made a big difference already. TPT is a voluntary organisation which carries out practical work on the Trans Pennine Trail between Penistone and Dunford Bridge. Workdays are held on the first Saturday of every month and during the week. 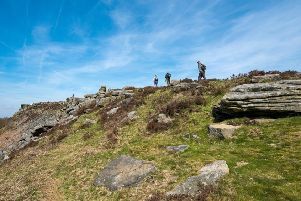 The aim of the group is to maintain the trail as a pleasant natural environment for the benefit of both the wildlife, and the general public.